Last November I presented at the Beijing Learning Summit. I have just spent the last 30 min wondering WHY I didn't blog this before, then remembered the Summit was just before the Global Education Conference, and then life just got busier! So, as we are about to embark on the second ever Flat Classroom Conference, AND as I am about to invite readers of this blog and Flat Classroom enthusiasts to participate virtually, I remembered I had put together information and ideas to do with successful participation in a virtual event. Let's start with one of my favourite photos, take at the Flat Classroom Workshop in Mumbai February 2010. These students are working in a team BUT the the girl in front is also working with a virtual team member via Skype from Japan. This picture is taken at the 'Create the Future' Workshop Kim Cofino and I ran last October. 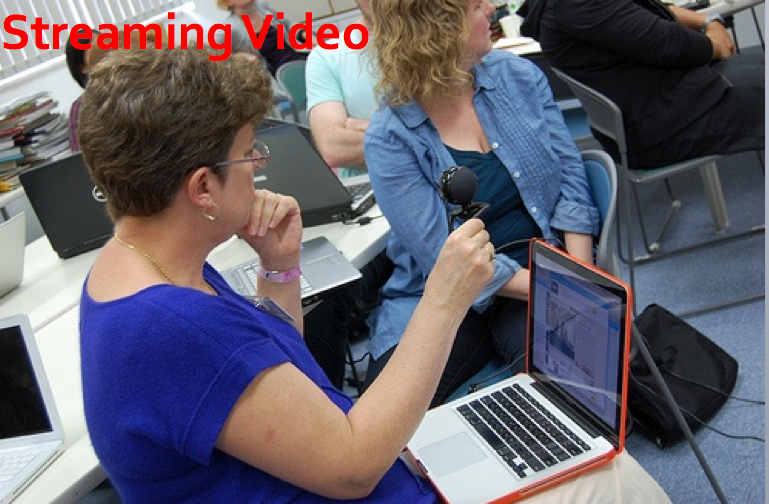 I am 'streaming' the presentations via video to our virtual audience who are watching and commenting via the chat. Make sure you are connected through the tools - know where to find the streamed video, know how to open the backchannel, know where to find the Twitter conversation amongst the 1000's of other tweets and volumes of social media. 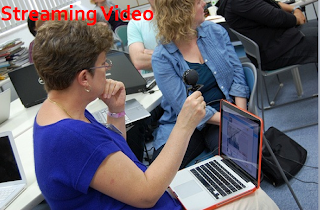 A good virtual workshop or conference will have an interface with full instructions. Make sure you study this first and download or open any tools needed beforehand. Using Elluminate for the first time for example takes a few minutes to download. If set up correctly a wiki or collaborative document will allow you to contribute synchronously and/or asynchronously. Remember the differences here, and don't think you have to be synchronous or in real time to be able to contribute. A virtual team member can support a team when the real time, face to face work has finished for the day. Remember, working from China to the USA means you can in fact be developing ideas and resources 24 hours a day! Jump in a co-create a product - During the Flat Classroom Workshop last July, real and virtual participants co-created presentations and final global project ideas. Nervous at first, participants gained confidence and skills as they juggled tools and timezones! Go Virtual at the Flat Classroom Conference! 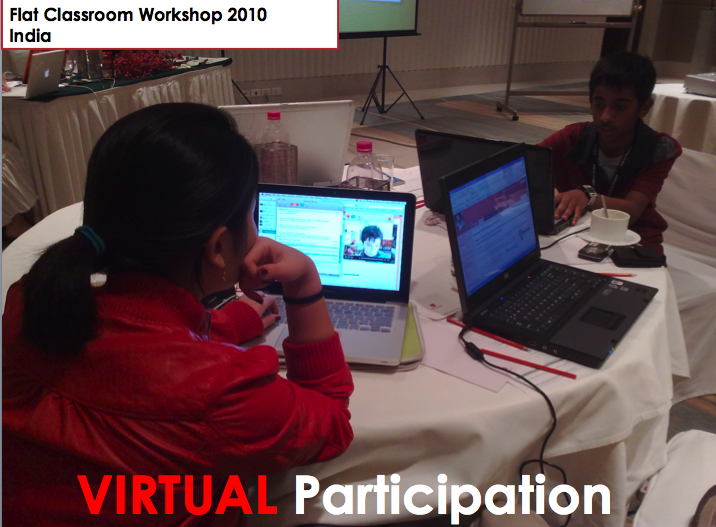 You are invited to be a virtual participant at the Flat Classroom Conference 2011, starting in less than 3 weeks from now! Partners for the conference, Taking It Global have put together a Virtual Flat Classroom portal through which our Web 2.0 places will feed. I have a tech team at BISS (conference venue) who will be streaming video, we will have a China-friendly backchannel happening and lots of opportunity for exploration and collaboration. One other VERY GOOD reason to participate virtually is to create new connections for future classroom collaborations. Don't forget to join our Flat Classroom Conference Ning as well! So, review the presentation below, consider HOW you can participate to build in success for your time commitment and come and join us...Go Virtual! View more presentations from Julie Lindsay.